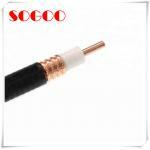 1/2" Superflexible Coaxial Cable Telecom RF Feeder Cable is made on advanced physical foaming insulation production line and argon arc welding, corrugating and slotting production line which are imported respectively from Austria and USA. 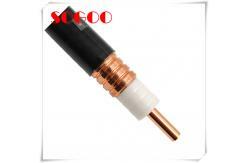 50 ohms corrugated copper tube coaxial cable is mainly used for the connection of transmitter, receiver and antenna and also connection between wireless communication equipments or other low loss and VSWR signal transmission at high frequency application. The cables is featured with low attenuation, low VSWR, small coefficient of temperature, strong corrosion resistance, good longitudinally water seal and high power capacity. 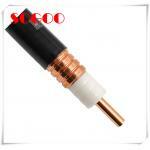 Technical data of 1/2" in superflxible feeder cable, is available by request. 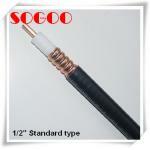 Except the 1/2" in superflexible feeder cable, we are also supplying other sizes, such as 1/4"s, 3/8"s, 3/8", 1/2"s, 1/2", 7/8"s, 7/8", 7/8"L, 1-1/4", 1-5/8" ...etc. Customize requirement is accepted. Welcome contact us for detail negotiation. 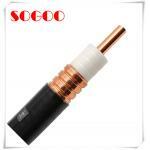 Look forward to your inquiry to Feeder cable 1/2" Superflexible Coaxial Cable Telecom RF Feeder Cable.